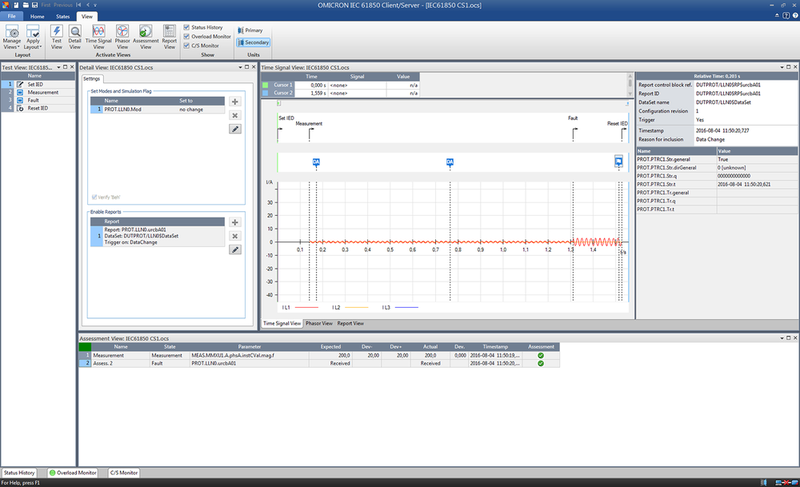 OMICRON’s commitment to innovation is also found in its powerful Test Universe software suite designed to control CMC test sets from a PC. The OMICRON Test Universe functionality includes. 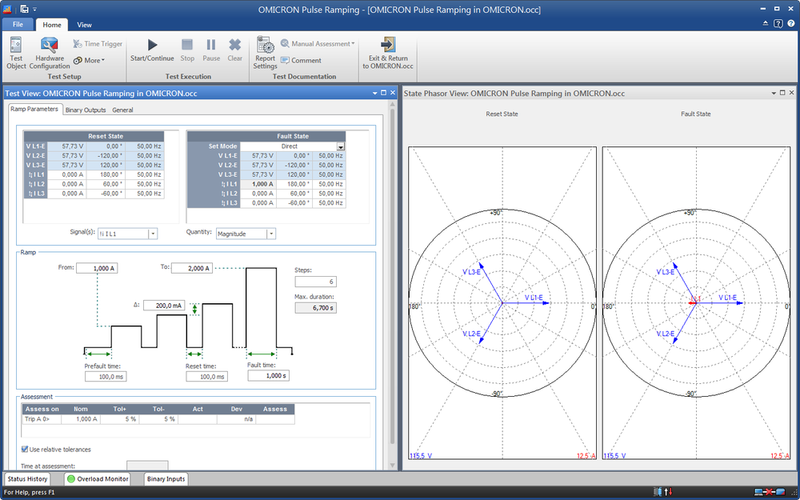 Quick PC controlled manual testing is easy with the QuickCMC module, by setting the voltage and current values, phase angles, frequencies, etc., either numerically or in the vector diagram. Additionally this module performs standard power system calculations, allowing the entering of the settings in sequence components, power values, impedances, etc. The module displays the binary input signals and performs time measurements. Together with the step and ramp function, thresholds such as pick-up values can be determined. The IEC 61850 Client/Server module enables testing the SCADA communication during protection testing. Correct testing of communication has never been easier. Additionally, the module provides an easy and secure way to automatically set an IED to test mode and to reset it to its original state after the test. The testing modes ensure that outputs will not be activated and that the tested device does not send any confusing information to the control center during the test process. Testers can control the IED modes (test, test/blocked, off, on, on/blocked) very easily and prepare the IED for the testing procedure. Offered with Test Universe Version 3.10 it makes the Test Universe software a client that directly communicates with the IEDs working as servers. Thus, Test Universe can access the entire data model of an IED and read it for protection testing. The module operates stand-alone and switches each setting value safely. It includes all functions necessary to access an IED and to test its communication. Different settings according to particular testing requirements can be embedded at the relevant place, and as often as needed, in OCC testing processes created and controlled by Test Universe. The module is always self-contained wherever it is placed within an OCC-document. 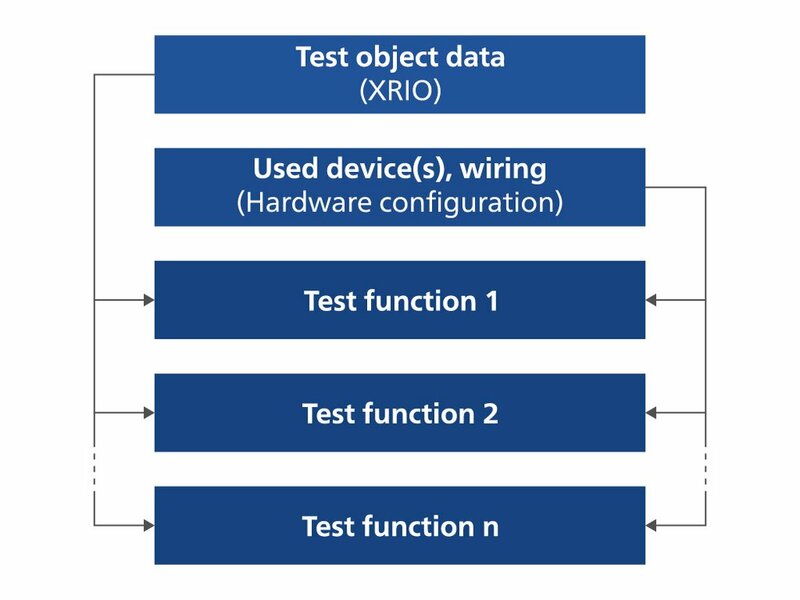 Besides PC controlled manual testing, OMICRON’s Test Universe software provides a variety of automated testing possibilities in dedicated modules especially designed for individual test object functions, e.g. for testing overcurrent relays, distance relays, or differential relays. In these modules, a specific graphic representation of the protection device’s characteristic (I/t diagram, impedance plane, etc.) 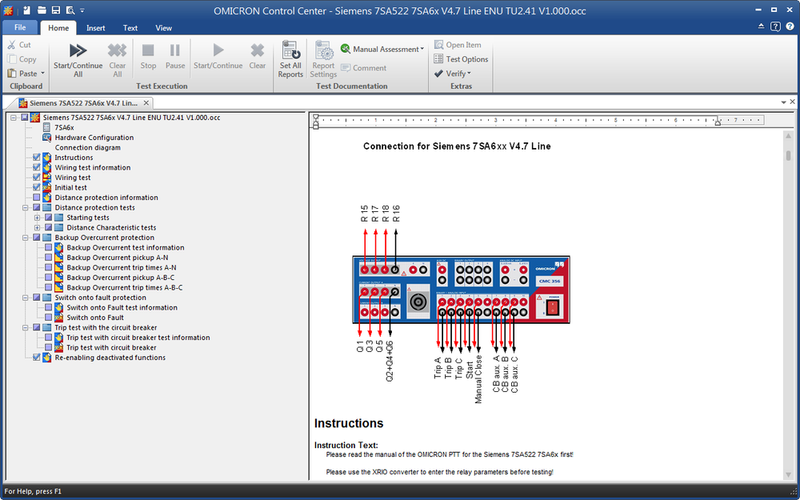 allows the graphical definition of test specifications as well as the visualization of the test results directly in the relay’s characteristic diagram. For creating and performing special tests not covered by the function related modules, the Test Universe software also comprises generic test modules. 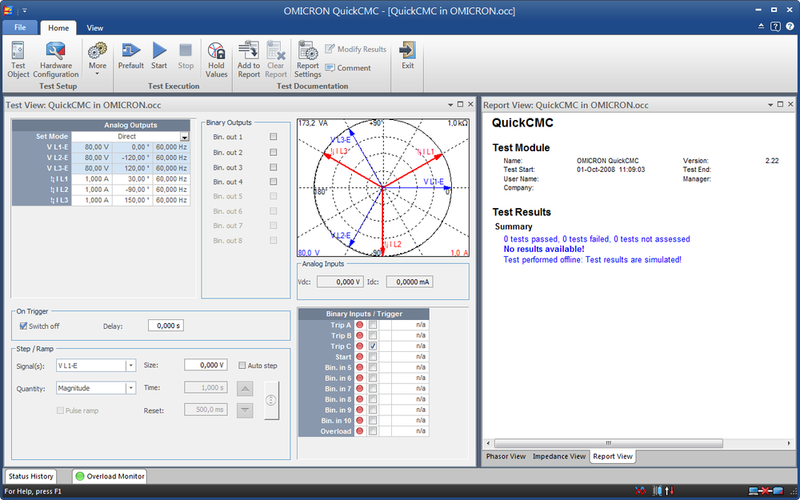 Besides the generic test modules OMICRON offers a wide variety of additional software that works with the CMC test sets (e.g. IEC 61850 testing solutions, network simulation software, scheme testing tools, etc.). 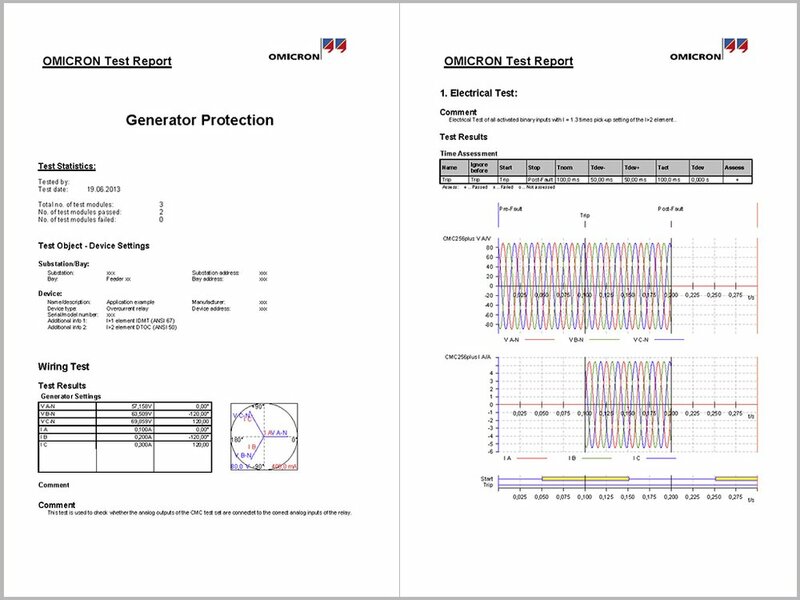 Each module provides a fully formatted test report. All test modules of the Test Universe software have a common element – the reporting function: Each module provides a fully formatted test report. Depending on the module the results come from, data is entered in tabular and/or graphical form. If several modules are used within the OCC to comprise a test, each module adds its specific piece of data to the overall report. After testing is finished, test results and assessments are entered automatically to complete the report. Reports can easily be printed, saved on file or in a database, or exported to standard office applications using Rich Text Format (RTF) and TXT format. Customizing test reports based on individual requirements is easy. The visible content of test reports can be defined independently from the recorded data, by just selecting or deselecting items from the list. Recorded data will always remain available, regardless of whether the user chooses to include them in the reports. Defined report settings are quickly and easily generated, saved with a form name, and reloaded at a later time; company specific elements like logos etc., can easily be included. 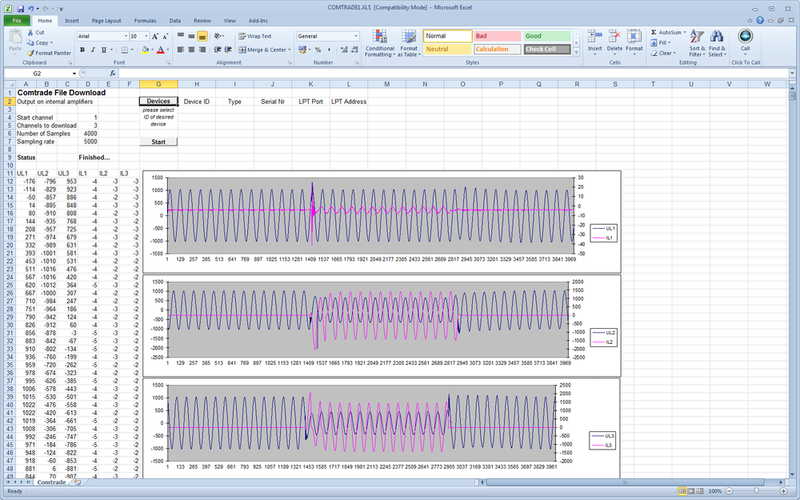 For special applications, the programming interface CM Engine allows users of CMC test sets to write their own programs. Thus, specific test and control requirements can be met, such as factory tests as performed by protection relay manufacturers. The programs can be written in one of the common programming languages such as C/C++, Visual Basic, C#, or LabView. It is also possible to control the CMC test hardware from thirdparty applications (like Microsoft Excel) that support Microsoft Automation. PTL’s test templates contain complete test plans for all important protection functions, XRIO Converters and parameter import filters. The XRIO Converters model the protection characteristics and tolerances (e.g., impedance zones, I/t diagram shape, etc.) based on the parameters and technical data documented in the manual of the protection device. Finding a particular setting is quite easy because the structure of parameters is modeled closely to that of the relay software. In addition, special filters allow the relay settings to be imported directly from the relay manufacturer’s software. The PTL is part of the Test Universe software DVD and available for free download in the Customer Area. 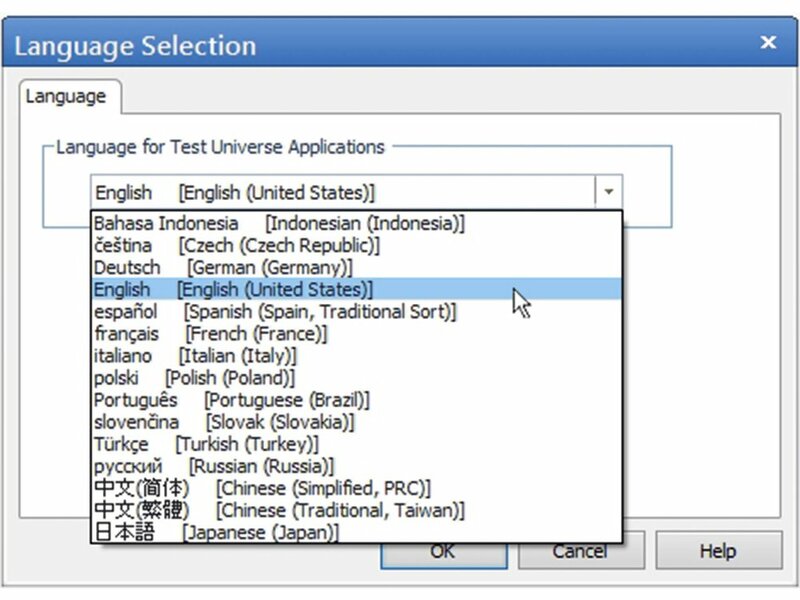 The Test Universe software is available in 16 standard languages. Changing the system language is possible at any time just by selecting the requested language in the “language selection“. All languages are automatically installed; no installation of any additional software components is required. Especially in international projects, clients many times wish to get a report in a different language than the commissioning engineer’s preferred working language. This is easily possible for all available standard languages. When the system language is changed and an existing test document is re-opened, the test report is automatically switched to the new system language set.